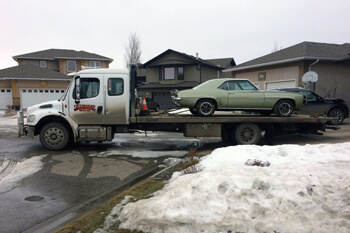 The owner of Outsiders Towing & Recovery in Regina opened his own business after deciding he could offer better towing services than those he experienced—so he purchased his first tow truck and got it fully insured. Today, the biggest car dealerships in Regina trust the Outsiders team to tow their vehicles, even a $135,000 Dodge Viper. Our skilled drivers have up to 9 years of experience and a clean driving record. We have the equipment to tow even the most high end vehicles, and have grown exponentially in employees, trucks, and trailers over the years. Our wonderful customer service is sure to turn any stressed customer into a relaxed and happy one when we’re finished. We always work together to get even the most challenging jobs done. Upgrading our equipment when new technology becomes available is a priority so that our drivers have what they need to provide the best towing service in the area. We now have a 2nd location in Lumsden, so we are able to serve even more vehicle owners. These guys are amazing! I would recommend them to anyone for all there towing needs. I Have used them many times and it's been a pleasure dealing with Cory, Jody and Sheldon. Keep up the great work. Rock stars with down home caring professionals. Proud to work along side them. Great bunch of guys! Hard working and CAA contracted. They have towed every vehicle I own. Awesome service. Won't use anyone else.